Congratulations Ryan Suda on Blacklava's 20th anniversary! So honored to be a part of the celebration and art exhibit. omg I'm listed as a "notable artist" in this article! Congratulations Ryan Suda Blacklava on your 20th anniversary! I am so excited to be a part of your art exhibit and your celebration! Thanks for all you do for our community! We were going to have an moonlit picnic at the park — teriyaki chicken musubi, steamed little dragon buns, a thermos of hot jasmine tea, and of course, plenty of mooncakes. Thirteen-year-old Hao Hao had already written up a grocery list (which suspiciously includes “Pocky — 1,000,000 boxes”). We had four pink and green paper lanterns and candles from Vietnam, one for each of the kids. It was going to be a rare Saturday night with everyone together, just to sit and eat as a family and look at the beautiful full moon, the Harvest Moon, while composing a poem or two for the Mid-Autumn Moon Festival (basically, Chinese/Vietnamese/Korean Thanksgiving or Oktoberfest … but without the beer). But then rain was forecast. 170 in 7 is a partnership between the following: 8Asians, AARisings, Angry Asian Man, Asia Pacific Arts, Asian American Donor Program (AADP), bigWOWO, ChannelAPA, Cheekswab.org, Disgrasian, Frances Kai-Hwa Wang, Jeff Yang (columnist, Wall Street Journal Online), Jook Time, JozJozJoz, Kimchi Mamas, Racebending, Reappropriate, Remembering Vincent Chin, Rice Daddies, Schema Magazine, V3Con, and a special partnership with Team Janet and Jeremy Needs You. Please return to this post for aggregated and updated information on the campaign. 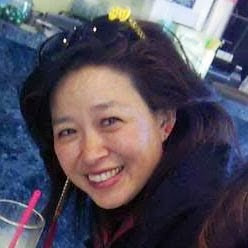 Jook Time: In memory of Janet Liang: Be one of the #170in7 today! Jook Time: Why be one of the #170in7? Roland Hwang, Attorney and founding board member and current Vice President of American Citizens for Justice, member Governor’s Michigan Asian Pacific American Affairs Commission, board member of Association of Chinese Americans Detroit and Michigan Roundtable for Diversity and Inclusion. Frances Kai-Hwa Wang, Writer and blogger for New America Media, Chicago is the World, RememberingVincentChin.com blog and postcard project, and former Executive Director and current Online Communications Chair on Advisory Board Member of American Citizens for Justice. Dr. H. Sook Wilkinson, Licensed clinical psychologist and Chair of the Governor’s Michigan Asian Pacific American Affairs Commission. Author of Birth is More than Once and After the Morning Calm. Prasanna Vengadam, Communications Instructor at Wayne State University, Director of Council of Asian Pacific Americans Michigan (CAPA-MI), and President of American Citizens for Justice. Curtis Chin, Award-winning writer and producer of “Vincent Who?” Co-founder of the Asian American Writers Workshop and Asian Pacific Americans for Progress, 2008 member of Barack Obama’s Asian American Leadership Council. For more information, check out the Advancing Justice Conference website! Jeremy--another reason to join the 170 in 7: A Bone Marrow Cyberdrive in Memory of Janet Liang. Be a part of the #170in7 bone marrow donor registration cyberdrive in memory of Janet Liang and benefitting patients like Jeremy. Asian Americans, hapas, and people of color particularly needed to register. Janet Liang video: 10 reasons why you should sign up to be a marrow donor. 10 reasons why you should sign up to be a marrow donor from Janet Liang. In March 2012, Janet Liang won the APAforprogress.org (APAP) 2011 Unsung Hero Award for her grassroots movement, Helping Janet, increase the number of AAPIs and ethnic minorities in the National Marrow Donor Registry. 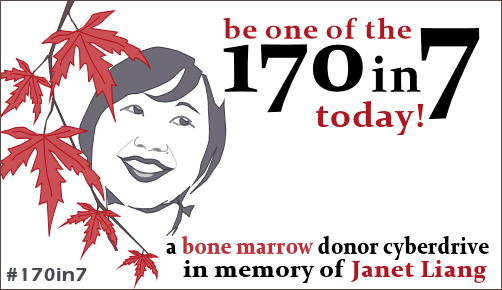 Posts about Janet Liang and the #170in7 bone marrow donor cyberdrive in her memory. For me, the year still starts in September and the beginning of school. Getting back into the rhythms of the season with my article in Chicago is the World (previously published in Pacific Citizen): "We find comfort and grounding here among the steamed buns." 3 weeks to moonfestival! freshly made mooncakes that support a great cause--the GIFT mentoring group that connects girls adopted from China age 11-13) with young Asian American women at the University, some adopted, some not. The mooncakes are made in Ann Arbor at Eastern Accents Bakery by the girls and their parents with no preservatives so they taste wonderful. They can be shipped anywhere in the world and also be picked up in Ann Arbor with no shipping charge. Are you registered to vote? Every eligible American should have a chance to cast his or her ballot in this coming election. Register here, courtesy of the Obama campaign!